The recycling we do at Crossroads goes way beyond taking our flattened cardboard to the local drop-off. We carry an ever-growing assortment of goods made from recycled material. 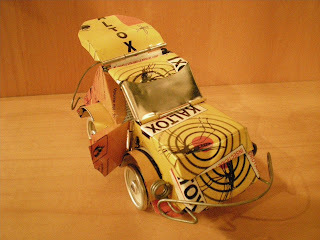 Our insecticide-can cars from Burkina Faso in West Africa (one of many styles of galimoto) reflect the ingenuity of kids and adults who fashion their toys out of what's thrown away. The Burkina Faso sparkplug musicians bring a note of whimsy along with a strong sense of design. 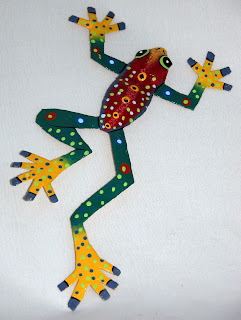 Some of our most popular recycled offerings come from Haiti. We do business with a group of men that flattens and burns out the residue from steel oil drums. The steel is cut into a variety of critters and painted in wonderfully cheerful patterns. We have lots of jewelry from recycled materials. 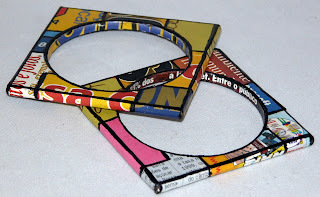 Brazilian magazine pages have been fashioned into bracelets and earrings. 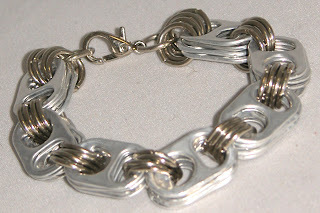 Our can-tab bracelets always bring hoots of recognition (perhaps some customers have their own collections?) when spied in the shop. But there's so much more here at Crossroads Trade. We'll be posting an entry about our wallets and bags made from recycled material. Our recycled items are made by artisans who can work without investing a lot of capital in supplies and who make a dent in reducing the waste stream around the world. And all our recycled roducts are a lot of fun. Our jewelry from Christopher Nieto, an artist from the Santo Domingo Pueblo (a place and a people, in northern New Mexico), arrived with a hand-written letter from him. Many of the pieces he sent are new designs, unavailable anywhere else. 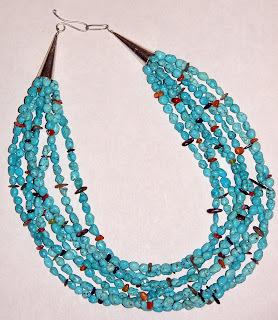 "The eight-strand nugget choker (blue turquoise) is from Nevada; it's a really good stone and color, some of the better quality I've come across in a while." 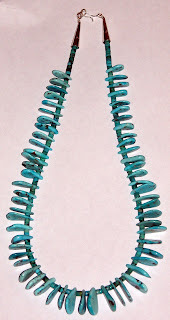 The single-strand necklace features turquoise from Kingman , Arizona, where Chris can get "a wide variety of different shades" at one time. 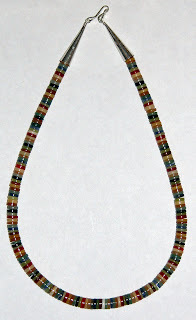 The multi-colored stone chokers are "all various stones from all over the world." Christopher Nieto jewelry sells for up to $1,500. Ours (we have more than what is shown here) range from $85 to $350. If you have coveted one of his necklaces, here is an excellent opportunity to acquire one at a good price.